There are so many issues I have with the headline and the image. My first thought was that the person who wrote the article doesn’t understand what’s going on so talked about something he / she did know, womans’ appearances. Or that they think this is what the readers will understand which is even more concerning. Or are they giving the people / public the info they want to know. It would be interesting know if a headline like this sells more papers. Do we live in a country that doesn’t really care what is happening with our politics as long as our PM is the one who has the best legs? I hope not. What message is this sending out to our children? I asked my daughter (10yrs old) what she thought of the picture. After rolling her eyes at me and asking if I was preparing another pshe lesson she stated “it’s two politicians having a meeting” Gender didn’t come into her mind. 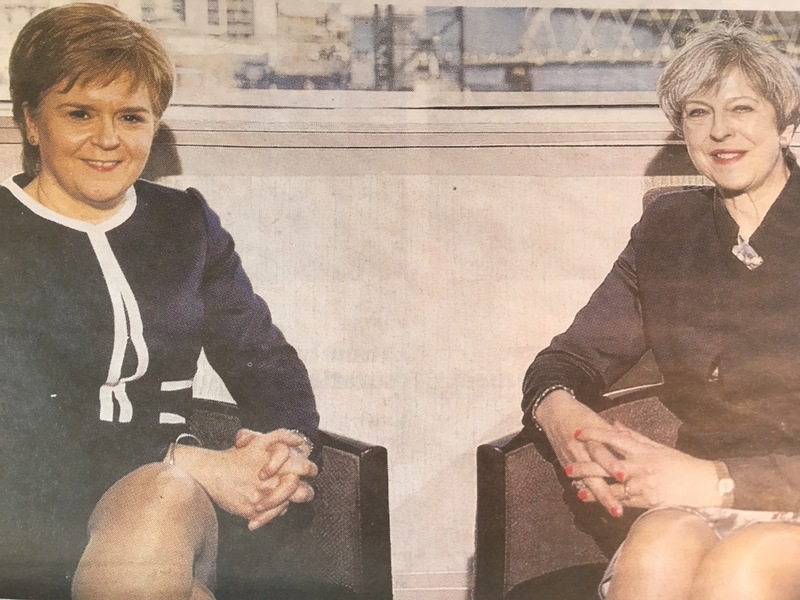 I then showed her the headline and she looked confused, ” have I got it wrong I thought one was our PM?” Then she asked but what was the meeting about, took the paper off me ( got it free on the plane) and tried to work it out. Later I asked her if she was any clearer about the meeting and she huffed. “No I went onto BBC news on my iPad and got real news” My 14 yr old son responded a little differently. “Why did they dress this way, normally they wear trousers”. I asked does it matter what they wear? He replied, “if they want papers to focus on politics then they shouldn’t wear clothes that press will focus on”. He then started telling me about Princess Diana wearing power suits to get her message across as certain charity events. Slightly stunned at my sons knowledge of Princess Diana clothes, I pondered on his comments. Do male politicians have the same restrictions/ awareness of what an outfit says about you? I don’t think so and this is what I have issues with. Ok I can hear the response now, it’s only a joke, not hurting anyone and the same happened to male politicians. But does it? I am struggling to remember them. Is that because I am a woman and only jump on the feminist bandwagon. Well it seems that google is also a feminist then, because going through the headlines on google I struggled to find many that commented on comparing two male politicians body parts. The only one was David Cameron and Ed Miliband on holiday in swimming shorts, but was more about the price of the swimming shorts. My final thought was I wonder what the headline have been if one of them had hairy legs?